Organised by Human Resources, Asia’s only regional HR media and events brand, Workforce Mobility Interactive 2018 will gather HR leaders and mobility experts from widely-recognised organisations to lead the latest conversation on staff mobility and expatriate management. For its fourth year, Workforce Mobility Interactive will address the most pressing issues surrounding expatriate programmes and the creation of a global workforce. The discussions will cover talent management, costs, and legal and regulatory issues. 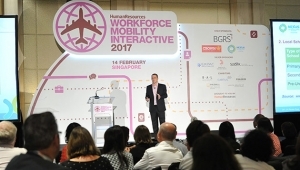 Workforce Mobility Interactive 2018 is a one-day conference which will take place in Hong Kong on 21 March, Kuala Lumpur on 6 February, and Singapore on 2 February. Workforce Mobility Interactive, Asia’s leading global mobility conference, is an exclusive invitation-only conference for director and VP-level HR professionals and mobility specialists representing major employers across Asia. Workforce Mobility Interactive 2018 will be packed with keynote presentations, panel sessions, and interactive round table discussions. Past companies represented on the Workforce Mobility Interactive agenda included CIMB, Ericsson, Johnson Electric, McCann, Shell, Yahoo, and many more. All presenters and panellists, such as Stephen Park, head of global mobility at Fonterra, are director or vice president level HR professionals with regional responsibility. To be held in Hong Kong, Kuala Lumpur and Singapore in February 2018, Workforce Mobility Interactive is Asia’s only regional conference on staff mobility and expatriate management strategy. Attendance to the one-day annual event is strictly by invitation only with invitations reserved for senior in-house HR professionals. Attendance is capped at 100 delegates. Workforce Mobility Interactive will deal with global workforce trends, repatriation strategies, succession planning for global talent, and mobility tools and solutions. To get a global and Pan-Asian regional view of staff mobility and expatriate management strategy, do not miss Workforce Mobility Interactive 2018. Senior HR managers and mobility specialists interested in participating in Workforce Mobility Interactive can visit the event website www.workforcemobility.asia.